When BlueSG first came on the scene in late 2017, I thought it was a model doomed to fail. Costing between 0.33 to 0.5 cents per minute, it felt like a total rip-off compared to hourly car rental services such as Smove and TribeCar. It was only later that I realised what BlueSG stood for. While hourly car rental services offer really cheap rental rates in comparison, it was near impossible to book a car on short notice. BlueSG should be seen as more of an alternative to taxis and private-hire vehicles, to fulfil unplanned and last minute travel requests. Essentially, it removes the cost of the hired driver from the equation and offers a cheaper rate in return. If you intend to use BlueSG in lieu of taxi and Grab rides, then the service is for you. If you intend to use it as your personal transport for hours at a time or for an entire day, look elsewhere. It costs nothing to join BlueSG. The only thing you need to do is to upload a copy of your NRIC (front/back) as well as your driving licence (front/back) to prove that you meet the requisite requirements to drive a BlueSG vehicle (or “Bluecar”). As long as you are 21 years of age and above and have passed your one-year probationary period, you should be all set to drive a Bluecar. BlueSG offers two membership options–a free membership which charges $0.50/minute and a yearly subscription at $15/month which charges you $0.33/minute instead. If you plan to use BlueSG for more than 88 minutes per month (which should be clocked up within three to four trips on average), then the paid membership option is more worth it. The membership structure is something that BlueSG can work on. By default, the free membership must be renewed every week and you have to re-upload your NRIC and driving licence each time. Thankfully, membership renewals are typically approved within a few hours, but it is still an unnecessary hassle. Perhaps the free membership period should be seen as more of a ‘free trial’ option rather than something to consider on a permanent basis. The yearly subscription option is reasonable, but not everyone wants to commit to one year at a time. Furthermore, there have been reports of members having their subscriptions auto-renewed for a further year without their knowledge. This is probably something one should be especially mindful about. I tried the free membership option for two weeks, as an alternative to the Grab rides I would otherwise take. Under the free membership option, I saved about $4 to $8 dollars each trip, depending on traffic and Grab surcharge. Then, I took the plunge and opted for the yearly membership. BlueSG has about 300 (and growing) locations in Singapore. There is one just a five minute walk away from my house at Serangoon North, which is why I’ve come to use BlueSG so often. For me, I find it really convenient because I always travel to the Tiong Bahru area every weekend, which is filled with no less than three BlueSG stations. However, to caveat, you may not be as lucky as me. If you stay near Hougang MRT, for example, the nearest BlueSG station is quite a distance away. Each BlueSG station has either two or four cars. Booking can be made only up to thirty minutes in advance. You will be charged a penalty fee of $5 if you do not retrieve the car after thirty minutes (though you can cancel beforehand to avoid incurring a penalty, in which case you will be unable to book another car for the next ten minutes). Though this policy is somewhat strict, it is probably for the best to prevent abuse (e.g. people running scripts to book the same car at every thirty-minute interval to secure a car for themselves) and helps to maximise availability. Maybe a longer grace period, say forty minutes, would be better in allowing users to plan their journey though. After booking a car, you proceed to book a parking space. Each parking space can be reserved for 45 minutes at a time. There is no penalty for not showing up on time, and no cooldown period. Availability depends on luck and timing. In the mornings, it becomes rather difficult to find a car in residential areas, since many of them would’ve been booked by people using them to get to work. Within the CBD, where there are not many BlueSG stations to begin with, parking gets filled up really quickly. So even if you manage to snag a car at your house, you may not be able to park the vehicle at the location of your choice. The reverse is true at night, where cars start disappearing around the CBD really quickly, and parking spaces start filling up. Coupled with the exorbitant ERP charges on weekday mornings, a premium bus (or GrabShuttle) is probably a better option than BlueSG. On weekends though and less popular areas, BlueSG availability is generally quite decent. I use it as a complement to private hire and taxi services–I first load up the app to see if there’s a car near where I am (and that there’s a parking space near my house). If so, I’ll take it. Otherwise, forget about it. On average, jam and all, my rides take about 30 to 40 minutes. That costs about $10 to $14 on a membership plan or $15 to $20 on a non-membership plan. Typically, a Grab or taxi ride requiring 30 to 40 minutes will cost upwards of $20. So, most likely you do save, especially on a membership plan. 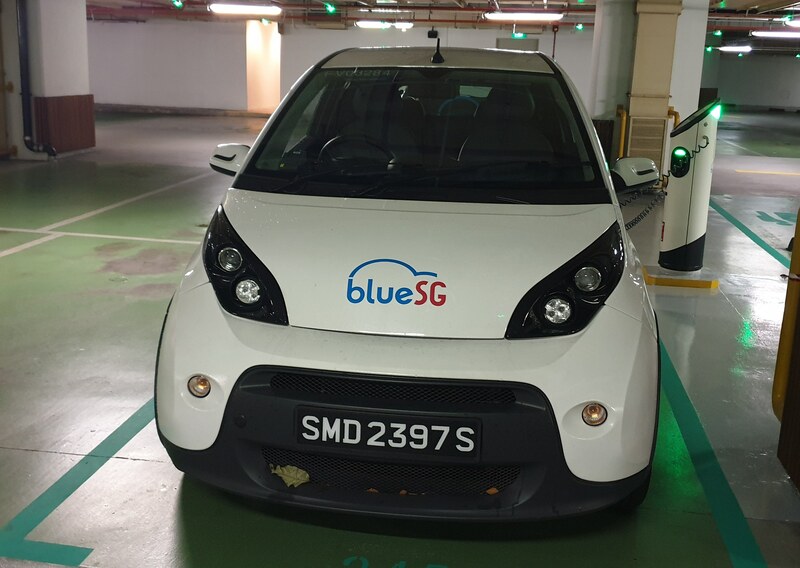 The singular model used in BlueSG’s cars is the Bolloré Bluecar. It has a maximum range of 250km, which is more than sufficient on Singapore’s roads. A typical trip on Singapore roads takes up about 10 to 15 percent of the car’s battery, so range anxiety shouldn’t be a thing. It also appears that the battery level in the car must be charged up to a certain percentage before you can book it, so you won’t run the risk of getting a car with little charge left. The car barely fits four full-sized adults. My experience is that with three to four adults, the car’s acceleration is pretty slow. Drive alone, though, and the car is able to zip from lane to lane without much difficulty. Acceleration is quick up to 80km/h and tapers off somewhat thereafter. At speeds above 80km/h, the car does not feel very stable. Still, it had no trouble keeping up with the other cars on the first lane on CTE. The car is full electric and is perfectly quiet when it’s not moving. On the move, it makes a rather high-pitched, whirring noise which may be disconcerting to some, though it isn’t very loud at all. Two important things to note: first, the car uses regenerative braking, so lifting your foot off the pedal will immediately initiate braking; second, the car does not creep forward at rest, so the car will roll back on a slope. What I usually do on a steep slope is to gently depress the pedal such that the car remains stationary. The turn signals and headlamp toggles are on the left stalk, whereas the wiper switch is on the right. Rather unintuitively, you have to rotate the stalk instead of pushing it downwards to activate the wipers. There are no rear wipers, by the way. Each car comes with a large, square screen which comes with navigation built-in, which can take you to your reserved parking space in just one touch. However, the reliability of the in-built navigation leaves much to be desired and has the tendency to steer you away from expressways. It also does not work completely sometimes. FM Radio used to work, but somehow stopped working in all cars since the start of April 2019. 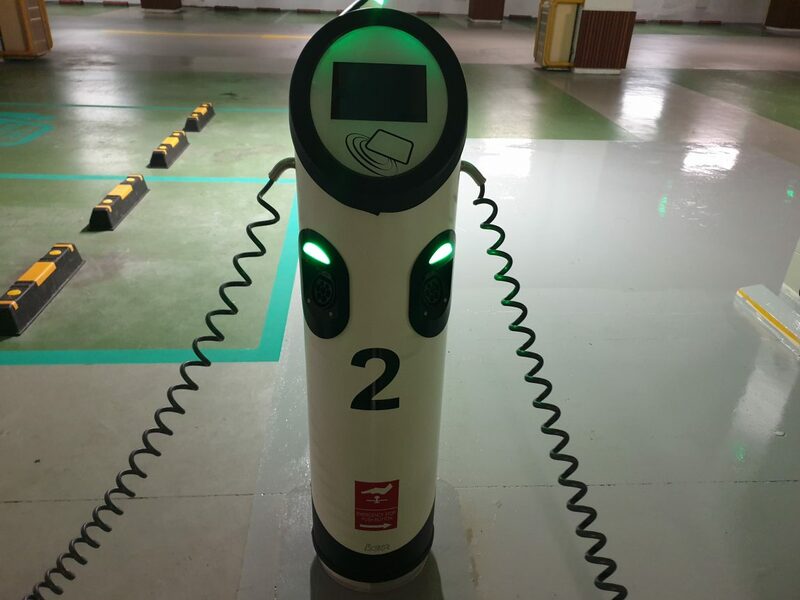 Each car, when not is used, is charged at an electric charging station as shown above. This station is also where you retrieve and return your car. The whole process is quite hassle-free: simply tap your registered EZ-Link card, key in your six-digit PIN on the touchscreen and accept the terms and conditions. The station will then point to you the car to retrieve, which you then unlock on the side of the car door using the same EZ-Link card. Once unlocked, simply press a button to release the charging cable and dock the charging cable back on the station. The IU in the car is CEPAS compatible, so you can slot in the same EZ-Link card which you use to register. You probably need an additional minute to adjust the mirrors and all, and then you’re good to go. Returning the car is much simpler. Just tap your EZ-Link card, press “Next”, and then plug back the charging cable. Once you’ve ensured that you have all your belongings with you, you can proceed to lock the door by tapping the EZ-Link card against the car door. Unable to turn the ignition key. This is due to a steering wheel lock, and can be resolved by wiggling the steering wheel while turning the key. Faulty air-conditioning. I experienced this on only one booking, so it should be a relatively rare occurrence. Beeping sounds when you first drive off. I experience this almost all the time, but it seems to go away within the first few minutes. Probably just a false alarm. Parking charges. In certain carparks, the season parking list may not be updated with the full list of BlueSG carplates, so you end up incurring parking fees. To avoid such incidences, do not insert your EZ-Link card fully until you exit the carpark. When you encounter a parking fee, press the intercom to speak to the carpark operator. Sometimes, they will let you through, though, for me, the carpark operator at Plaza Singapura refused to budge. You can still get a refund from BlueSG when you write in, though, with evidence of you incurring the cost. For an EZ-Link card, you should be able to check your transaction history on the mobile app, although this takes a few days to be reflected. Buggy user interface on charging station. This happened at one of the charging stations at my house. It resulted me in being unable to press “Next”. I reported the issue and it was fixed very quickly. Radio not working. This has been an issue since the start of April across all cars for some reason. Thankfully, BlueSG support is very responsive. They seem to have operators working round the clock and calling their hotline will get you to a real human being immediately, without having to key in additional numbers. Overall, none of the issues I have experienced have been deal-breakers. It would probably be a major issue, if say, the cars tend to break down in traffic, or the brakes are faulty. So far, I have had no such issues. 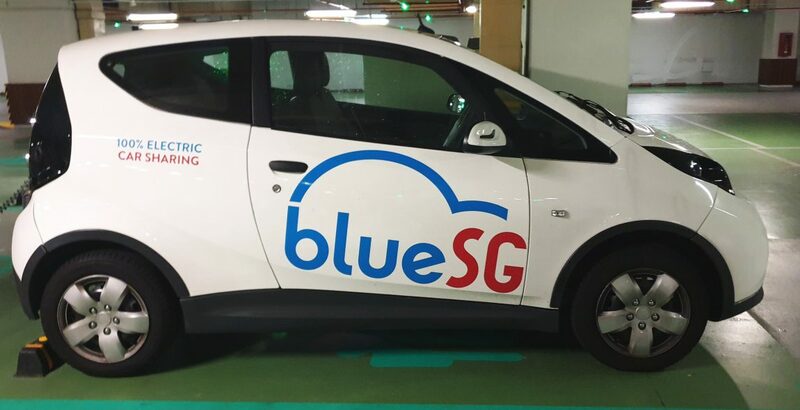 As of now, even given the current pricing structure (which some may find too expensive), I find BlueSG to be a reasonable alternative to ride-hailing services and would recommend that you give it a try, especially if you enjoy or don’t mind driving. Sony Lucky Bag — What’s in the Bag?